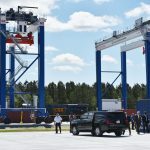 DILLON, SC – April 16, 2018 – Today South Carolina Ports Authority held the grand opening of Inland Port Dillon, its second inland facility constructed in the state to handle strong growth of the Port’s intermodal rail cargo volumes and deepen the Port’s reach into markets through the Carolinas to the Northeast and Midwest. 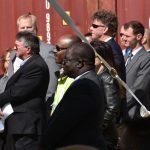 Nearly 400 people gathered to celebrate the grand opening of Inland Port Dillon. 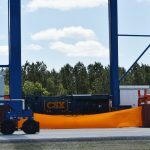 Inland Port Dillon utilizes an existing CSX intermodal train service to handle container movement to and from the Port of Charleston’s productive seaport facilities. 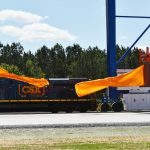 Inland Port Dillon is expected to convert an estimated 45,000 container movements from truck to rail in the first year of operation. 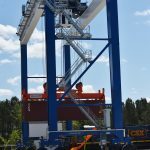 The facility will handle the growing volume of container cargo traveling to and from the Port of Charleston via intermodal rail, which has increased 180 percent increase since 2011. Today, nearly 25 percent of the Port’s container volume moves by rail. 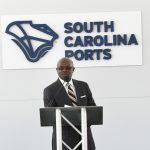 SCPA opened its first inland facility, Inland Port Greer, in the Upstate region of South Carolina in November 2013. 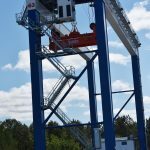 Inland Port Greer handled a record-breaking 124,817 rail moves in calendar year 2017, an increase of 20 percent over the previous year. 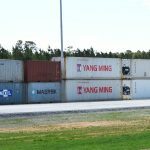 Inland Port Dillon is located within the Carolinas I-95 Mega Site with close proximity to I-95, a critical transportation artery in the Southeast. 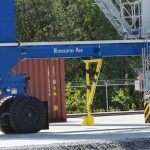 The area is central to a significant base of existing Port users, including Harbor Freight Tools, that represent base cargo opportunities for the facility. 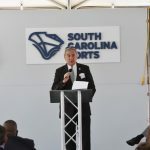 “Inland Port Dillon is a complement to the capacity and infrastructure investments underway at port facilities in Charleston to accommodate bigger ships and overall growth of our volumes,” Newsome said. 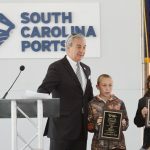 Two fourth-graders at Latta Elementary School each earned $500 from SCPA for their school for their participation in a port contest to name equipment at Inland Port Dillon. The contest was open to all third through fifth graders in Dillon School Districts 3 and 4 during the month of March. 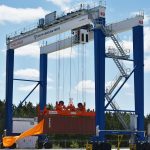 Over 100 student entries were received as potential names for the terminal’s two rubber-tired gantry (RTG) cranes, which move containers on and off trains. 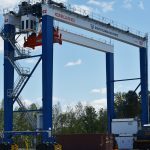 A team of SCPA employees selected the following two entries, which have been painted onto the cranes: Bluesaurus Rex, submitted by Emily Baxley, and Incraneable Hulk, submitted by J.P. Bley. 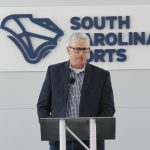 As previously announced, South Carolina Ports Authority completed the third quarter of its fiscal year with 1.4 percent year-over-year growth of twenty foot-equivalent units (TEUs) and record-breaking March volumes. March was the strongest month in the Port’s history, with 199,659 TEUs handled during the month. 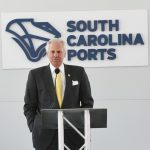 Fiscal year to date, SCPA has moved 1.6 million TEUs across its docks. Finished vehicle volume also reached an all-time high in March, with 28,391 vehicles handled last month. In the overall non-containerized business segment, SCPA has handled 556,901 breakbulk tons since the fiscal year began. 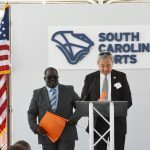 South Carolina Ports Authority (SCPA), established by the state’s General Assembly in 1942, owns and operates public seaport facilities in Charleston, Dillon, Georgetown and Greer. 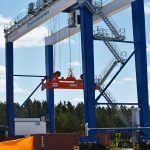 As an economic development engine for the state, Port operations facilitate 187,200 statewide jobs and generate nearly $53 billion annual economic activity. 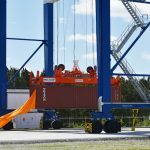 SCPA is soon to be home to the deepest harbor on the U.S. East Coast at 52 feet, and the Port is an industry leader in delivering speed-to-market, seamless processes and flexibility to ensure reliable operations, big ship handling, efficient market reach and environmental responsibility. 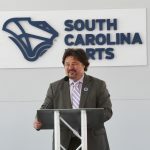 For more information on SCPA, please visit www.scspa.com. Click on a photo once to bring it into a single screen and then again to enlarge. 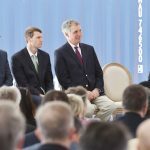 The grand opening of Inland Port Dillon was held on Monday, April 16th with the opportunity and promise that this brings Dillon County highlighting the ceremony. 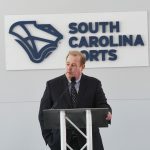 Jim Newsome, President and CEO of the S.C. Ports Authority, asked who in their wildest dreams could have imagined this five years ago. 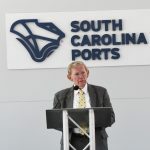 Dillon County Council Chairman Stevie Grice said he was “super-excited” about the grand opening of the port. He thanked several who made the port possible. He then gave the invocation and asked Dillon High School student Jacorie McCall to give the Pledge of Allegiance. 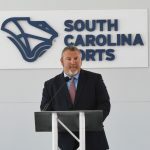 Dillon County Administrator Rodney Berry said they were embarking on a tremendous journey and thanked several people who contributed to bringing the port. Rep. Jackie Hayes said we won a state championship today with the grand opening of the inland port. He spoke about the opportunity and challenges and the leadership and working together. 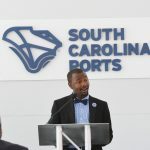 He said the port will create jobs that will make young people come back to Dillon. 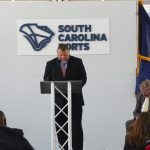 Kellen Riley, Manager of Industrial Development for CSX, said that this was a very exciting day for Dillon County and the state of South Carolina. He said this was just the tip of the iceberg. He said numerous industrial customers are contacting them now on how Dillon can support their business. He offered his congratulations. 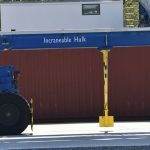 The anchor tenant of the Inland Port is Harbor Freight Tools. 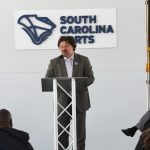 Robby Roberson, Vice-President, East Coast Distribution Ops for Harbor Freight Tools, encouraged those in attendance to keep turning the wheels of industry. 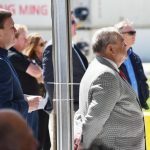 Senator Kent Williams said this was about investment and the return on the investment for businesses as a result of these efforts. He said this will have a great effect on the quality of life and in creating jobs for the people of this area. He also spoke about teamwork and said this was a move in the right direction for this community. 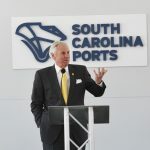 Senator Hugh Leatherman said that Inland Port Dillon will open the Pee Dee Region up to the rest of the world. He said this was the “Gateway To the World.” He said this will not be the end. 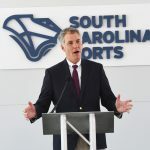 Congressman Tom Rice said he didn’t think that people realize how huge this facility is going to be to the area and what it will do to transform the area. 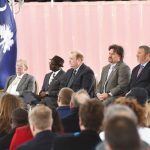 Governor Henry McMaster said this is the beginning of big things and this is what success looks like. Newsome then called on Michael Elmore who conducted a countdown and then the two cranes cut the ribbon. This ceremony will be available for viewing on The Dillon Herald’s channel on YouTube.